Shirley Jump focuses on thirty-year-old Nora O’Bannon Daniels in the second of her O’Bannon Sisters novels. Nora is the sister who has always done everything right, the responsible sister, the one with the happy marriage and two terrific kids. What none of her family or friends realize is that Nora’s perfect life is falling to pieces, and Nora herself is a heartbeat away from a meltdown. Her husband Ben has gambled away the family’s reserves and run them so far into debt that the bank is foreclosing on their home. Her once cheerful, lovable daughter is in trouble at school and distancing herself from her mother. Even her work at the family bakery is not problem free since Nora maintains the lie of her happy life with her mother and sisters. Nora is ready to give up on her marriage. She just has to decide how she will manage to support herself and her children. When the youngest O’Bannon, the wandering Margaret, affectionately known as “Magpie,” the sister to whom Nora has always been closest, calls with an invitation for a beach weekend, it gives Nora a reprieve from her troubles, albeit a temporary one. Meanwhile, Ben is doing his best to make amends. He sought help for his gambling addiction, and it has been a year since he last gambled. But it may be too late to save his marriage. Nora has lost her trust in him and her belief in them as a couple. Her beach weekend offers temptation in the form of a charismatic artist neighbor. Magpie has problems of her own, but neither sister can quite decide to confide fully in the other. Nora returns, having found a place for herself and her children to live in her grandmother’s home, but with her basic problem unresolved. Nora’s need for control and her obsession with being the perfect daughter, sister, wife, mother are rooted in her childhood experiences. Readers may grow impatient with Nora initially, but as she comes to understand herself better, they will likely find her more sympathetic. This complex tale is set against the background of this Irish-Catholic family’s faith, which adds another dimension to the novel. Secondary threads add more tension to the story. Magpie has a vital decision she must make. Also, the friendship of O’Bannon mother, Colleen, and Roger O’Sullivan is moving into romance, but Colleen must change her perception of herself as the wife of Michael O’Bannon, the husband who has been dead for two decades, if she is to move forward with her life. Jump again blends romance and women’s fiction with a deft touch as she continues the story of the O’Bannon women. If you like novels that are a mix of women’s fiction and romance with the heroine’s personal journey and female relationships as important as her romantic relationship, I think you will enjoy this book. 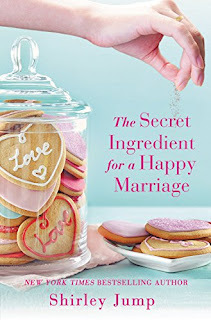 It can be read as a standalone, but those who have read The Perfect Recipe for Love and Friendship will have a more nuanced reading experience. After two books, I am invested in these characters and eager for the next book that I expect to provide a conclusion to Magpie’s story. I believe I have one of the previous ones on my tbr. Thanks for the synopsis on this one. I have several of her books on my TBR--must read them. I've read other books by Shirley Jump which I've totally enjoyed. This series sounds really good and has been on my tbr list for a while.